New major version 10 of Swift To-Do List has been just released! 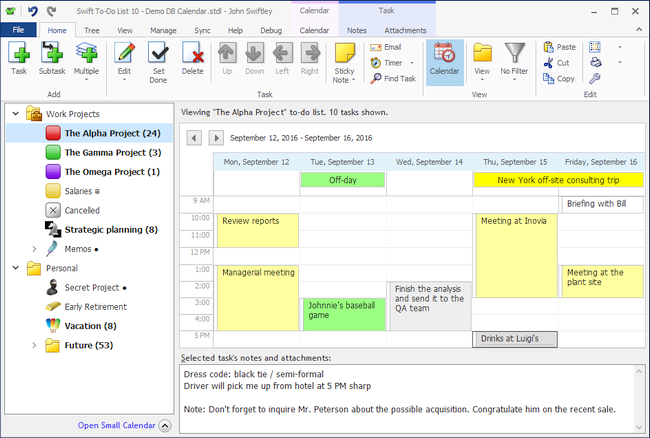 It just might be the best and greatest to-do list software ever created for Windows. You can download the new Swift To-Do List 10 here. See more about What’s New in version 10 (includes more screenshots). Customers who have already tried the new version love it! Download the new Swift To-Do List 10. If you have already Swift To-Do List installed, all your data will be fully preserved. If you already own Swift To-Do List, you either get the new version for free (in case you’ve purchased Swift To-Do List on November 24, 2015 or later and thus own a subscription), or with a discount. To claim your discount, simply download the new version and click the “Upgrade to Subscription” button on the top-right. Enjoy the new Swift To-Do List and your new control of your time!